It is important to know how to get rid of bed bugs naturally. These tiny blood-sucking creatures are about the size of a sesame seed and often appear as small dark spots on your bedding. Many people immediately try to remove them using insecticides, but what about the effect of these chemicals on you while you are sleeping? It is far better to use natural ways of removing bed bugs, and we provide you with a number of these below. First of all, where do you find bed bugs and how do they get there? You will find them mostly in or close to places where they can hide. You are looking for dark-colored spots and grains on your mattress, encasements, sheets, comforters and so on, particularly around the seams. They are easily seen on pale-colored surfaces and white bedding. They also hide in cracks, joints, and ridges in your wooden bedroom furniture and mattress foundation. Where they come from: Many people bring them home from traveling – vacations or business trips. You can pick them up on your clothing, suitcases, bags and other items. Why are they mainly found in the bedroom? They don’t have to be, but that’s where you tend to notice them more. Clothing, bags, purses, suitcases and so on are often deposited in a bedroom, and once you get into bed, that’s where they will head for in search of a meal! Bed bugs are very mobile, and once they find you in bed, they set up their home there – right in their dining room! They are attracted by the carbon dioxide you breathe out when sleeping. They can be destroyed using chemical methods, although the same chemicals can also be harmful to you and your family. If you decide to call in a professional exterminator, they are tending to use natural methods themselves these days for the same reason. It’s not good to be in contact with potentially harmful chemicals all night! It is far better to use natural methods, some of which we have described below. They are easy to find and easy to use, and they are also effective. So let’s start with physically evicting them. Vacuum Cleaner: We are not suggesting you pick the bed bugs from your bedding individually – one at a time. That would take forever! You could vacuum them up, and over time you may get the vast majority, but they know when and where to hide. In any case, they would likely live in your vacuum cleaner and reappear after a while. Bed bugs can live for many months without a meal! Duct Tape: Press down lengths of duct tape (the stickier, the better) along seams and other places where the bed bugs might be living. Remove the duct tape, and the bed bugs will come with it. Put the used tape in sealed bags for disposal or burning. It may take a few applications to get rid of them completely – it takes only two bugs to generate another infestation! Double Sided Tape: You can stick double-sided tape round the perimeter of your bed’s base and its foundation. Also right round its foundation. This will catch any bed bugs trying to get up onto your mattress and bedding. In fact, anywhere you are able to attach it. This is particularly important after you have taken the steps above and/or below to eradicate them. You don’t want new bed bugs climbing up onto your bed, attracted by the CO2 of your breath. Bed Bug Traps: In addition to the double sided tape traps, as explained above, you can use traps that emit the carbon dioxide that attracts bed bugs. Along with a little heat or light to attract them, they attract the bed bugs into the trap and keep them there. It’s a bit like sticky tape with a bug perfume that attracts them. The bugs get caught in the adhesive, and you can remove them all the next day. Other than the vacuum cleaner, each of these bed bug traps or lures trap the bugs for disposal later. You can often get an idea of how well they are working from the reductions in numbers you are catching. Bed bugs are true insects, unlike mites and ticks that are arachnids – members of the spider family. There are natural insecticides/pesticides available that will safely resolve your bed bug problem. If you have small children in your home, they may notice these little black spots, so it would not be safe to use a chemical spray. However, an organic insecticide that is safe for children would be ideal. Not only that, but organic insecticides are eco friendly – unlike many chemical insecticides. If you want a simple solution that can simply spray over potentially infected areas without using potentially dangerous chemicals, then this is the one. A test was carried out in Indiana, USA, using a number of biopesticides. 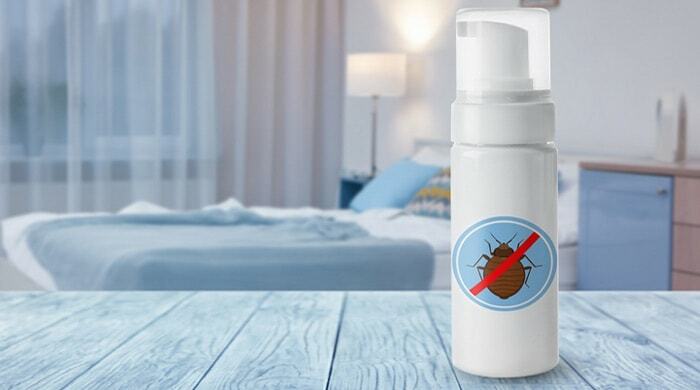 Considering the results, we recommend you use Ecoraider, a non-toxic natural bed bug killer, also recommended by the Entomological Society of America Journal. Our second choice organic insecticide is Bed Bug Patrol, which came second in the test. Each of these is safe for you, your children and your pets. You can spray your mattress, bedding, and the bed frames and foundation. Once you are confident of having the problem under control, you can use the double sided tape to prevent bed bugs in any other part of your bedroom from getting onto your bed. Sometimes applying tape to the legs or other parts of the bed in contact with your floor is enough. 3. Boil them to Death! Another way to kill off bed bugs is to use a steam cleaner and boil them to death! Don’t be squeamish when killing bed bugs! It’s them or you, so make it you! You can use duct tape on hard surfaces, and double sided tape to catch them on that type of hard surface. However, you will find that most bed bugs will live close to you – in and on your mattress and your bedding. So when it comes to soft furnishings such as mattresses and other textiles, then boil them to death (The bugs, not the textiles!) A steam cleaner will kill off any bed bugs on any fabric. Like in space, nobody can hear a bed bug scream! Not that they can anyway, but they can make you scream – so beat them to it with a steam cleaner. You not only kill the bed bugs, but you also kill off their eggs and nymphs. In fact, steam cleaning is the few methods available to you that kill the eggs as well as the adults! These are the only other reasonably effective insecticides that can be used safely to remove bed bugs. Neonicotinoids are extracted from tobacco and affect the nerves of bed bugs to become overactive and kill the insect. This solution is not as safe to humans as those methods above, but if you are not lying down in the treated areas, then there should be no issues. It is one more way to deal with bedbugs, though they should not be used on any part of your bed that can be in contact with your body for any prolonged period – and not for children’s beds. There are two types of bed bug traps. Passive traps are just like the double sided tape: they catch them as they travel from ground level up to you when you are sleeping. You can use petroleum jelly such as Vaseline to trap them. Simply rub it over the legs or stands that support your bed, or even on the wooden parts of the bed close to the mattress. Active traps are similar, but they emit an attractant such as heat and/or small amounts of carbon dioxide. The bed bugs sense you may be near, so close in on the trap that catches them in the same way as the passive traps – petroleum jelly or some other sticky substance. Traps that rely on the slipperiness of the surface to prevent the bugs from climbing out do not always work. It may depend on the degree of ‘slipperiness,’ or maybe they form a bed bug pyramid where the top guy can leap out – who knows! A sticky substance is better than a slippy substance every day! Once you have rid your bed of bed bugs, you should then tackle any areas in your bedroom where they may be hiding. If you have carpet, give it a good vacuum over and then give a good sprinkling of natural insecticide powder such as cedar powder. This can give protection for up to a year and is safe for your children and pets. If you have cracks in the structure of your bed, then seal them up. Bed bugs will hide in dark places until they sense your smell – your CO2 smell that is. It attracts them like a bear to honey! They have even been known to hide behind the skirting or baseboards of your walls. It might help to seal these up. If you have a lot of clutter in your bedroom, then it may pay to clean it up. Bed bugs can hide in clothing, toys and other items that are left lying around for a while. Tidy these up, but give them a good clean first. Bed bugs can hide anywhere in your bedroom and come out at night, attracted by your breath. Other ways of how to get rid of bed bugs naturally have been proposed, some with a fair degree of confidence. However, none of these are as effective as those above. Some propose the use of essential oils such as lemongrass and lavender oil – even tea tree oil. The problem with essential oils is that have to be used at 100% full strength to be even partially effective. It’s not only expensive, but that concentration can be very harmful to you – and particularly to your pets and children if they come into contact with concentrations high enough to kill bed bugs. So we do not recommend essential oils. Burning thyme is another potential way of killing bed bugs! Yet, you have to create so much smoke for it to be effective that it would also be a health hazard for you! So no! Then most enticing breeding ground for bed bugs is your mattress. The same is true of dust mites, but they offer more of an allergy issue than bugs sucking your blood. So now that you have got the bed bugs out of your mattress, how do you keep them out? Or maybe you failed, and they are still inside your mattress! Perhaps you are simply sick of the problem and just want it to go away! Whether you want to prevent bed bugs getting back into your mattress, or you want to keep them in there, and away from you, the solution is the same – a mattress encasement. Mattress encasements are designed to keep what is outside the mattress out, and what is inside it in! The out includes beg bugs, dust mites, skin cells, urine, and other liquid or semi-liquid contaminants. The in includes dust mites and bed bugs – a mattress encasement protects you from bed bug attack from within. It is too finely woven to allow bed bugs out – so they eventually destroy each other to assuage their hunger for blood! Mattress encasements are not a way of how to eradicate bed bugs, but they do contain those you already have in your mattress. That’s why they are not #9 on our list of to get rid of bed bugs naturally. An encasement also isolates them from you while you are sleeping. You can find our best recommendations for mattress encasements here. There are several ways to get rid of bed bugs naturally. Some are more effective than others, and it can be very much a matter of personal preference which you use. The easiest method may be to simply spray them with a natural organic spray such as Ecoraider. However, having done that, you can reduce the chances of further infestation by occasional steam cleaning and be using physical barriers such as sticky tapes and traps. How you use this guide on how to get rid of bed bugs naturally is up to you, although if you follow the advice given, you should soon be rid of any bed bug infestation, and prevent any recurrence. A mattress encasement will help significantly in preventing these tiny creatures from infesting and breeding in your mattress – and also keep any already living in there in there and not on you!